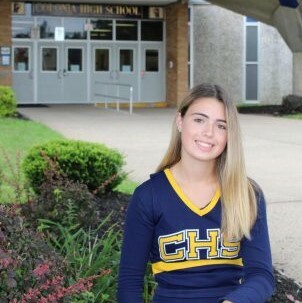 Emily Vogler is a 17 year old girl that is a senior at Colonia High School. She is a cheerleader who used to play softball. She has been cheering for 12 years and played softball for 7 years. She has been working at Colonia natural pharmacy for two years and plans on staying there until she graduates college. Emily has two younger sisters one in high school and the other in middle school, Olivia who is 15 years old and Sophia who is 13 years old. After she graduates high school, she plans on going to college. Emily is is thinking about going to pharmacy school and following in her mom’s footsteps in going into the medical field.